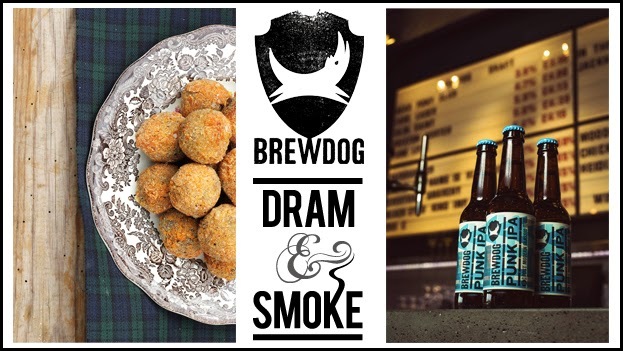 The wonderful Dram & Smoke - who ran a Scottish pop-up over the winter - is teaming up with Scottish brewer Brewdog this Easter for a one-off Sunday lunch. 6 courses - including Haggis Bon Bns, and Beer-Battered MarsBar - paired with 6 Brewdog beers, at the Brewdog bar in Shepherd's Bush for just £35, and then you've very welcome to stay and continue drinking. "Craft beer powerhouse BrewDog and Scottish pop-up Dram & Smoke are teaming up on the 5th April to offer an Easter Sunday lunch with a hoppy twist. Hosted at BrewDog’s Shepherd’s Bush bar, the £35 ticket gives guests six courses of Scottish fare paired with a tipple chosen by BrewDog’s resident beer experts to perfectly complement each dish. Beer geeks out there will have the BrewDog crew on hand to chat through all the pairings on the day. The Dram & Smoke lads will be dishing out typically tongue-in-cheek Highland classics. Yes, that does mean that deep-fried Mars Bar gets a look-in when dessert rolls around. A whisky barrel smoker takes centre stage in creating the other dishes on the menu and, although you won’t find the traditional chocolate Easter bunnies here, Little Bunny Foo Foo does make a brief appearance... after being braised in Punk IPA for four hours and served on a tattie scone. Some of the courses will be served up family-style and the menu will focus on bigging up the best of Scottish produce in the company of the best beer going. Dead Pony (Beer) Battered Mars Bar, Cornflake Ice Cream & Irn Bru Drizzle"